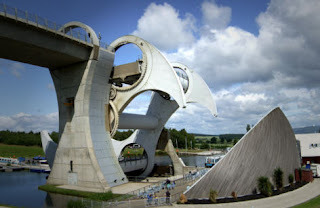 Anne and I played at tourists yesterday and visited the Falkirk Wheel, not by bike although there were lots of cyclists around, we did it the lazy way by car. Quite a contraption and a piece of original engineering I did think though it is getting a bit tatty and in need of a bit of TLC. We parted with £7.50 each and took the short gondola trip up to the top through the tunnel and back. The day was clear so we got the best of the views. See some photos below. Today I managed a day of cycling but in three parts, AM my cycling pal Tom and I had a short cycle on an Eglinton Dalgarven loop. He had visitors coming PM so had to be back sharp. Then Anne and I had a Hunterston Peninsula circuit starting down the beach track, through Thirdpart and looping to make a very pleasant figure of eight. The sun was shining, it was cool and clear, just lovely for a cycle. When we got back I had a little bite to eat and set off on the road bike over Fairlie moor. I've been doing it a few times recently to try and get a bit of fitness back into my legs. I think its working, today felt a lot easier, although that may just have been the wind direction. Altogether a rather good days cycling.